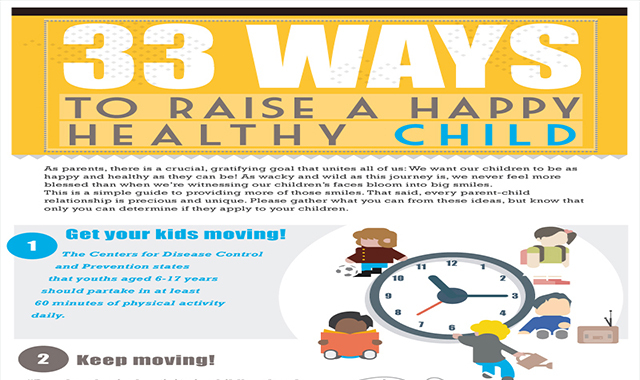 33 Ways to Raise a Happy, Healthy Child #infographic ~ Visualistan '+g+"
There’s no greater joy for a parent than raising your child into a happy, well-adjusted adult, ready to take on the world. Along the way, there will be trials and tribulations, but the overarching memory will be of the unique and precious quality they bring to your life. However, as a parent, your responsibility is not just enabling a happy childhood, but also providing the building blocks for a healthy life. This infographic discusses 33 simple strategies for developing a positive-health attitude and lifestyle from the earliest years – in short, creating a culture of movement.